Governor Andrew Cuomo came to Lake Placid on Thursday morning to tout his budget for the Adirondacks and the rest of the North Country. Cuomo said his administration has spent tens of millions of dollars to promote tourism throughout the state as well as the Adirondacks. That investment, he added, resulted in a $9 billion increase in the tourism economy. The governor, who often vacations in the region, said the Adirondacks and most of upstate had long been ignored by state legislators, most of whom hail from New York City or Long Island. “They might as well be talking about Wyoming, because they just don’t get it,” he said. He said previous governors also largely ignored the Adirondacks, in part because the region is sparsely populated and thus lacks electoral clout. $75 million for roads, bridges, and other infrastructure in the North Country. $32 million to create an Adirondack gateway at Northway Exit 29, site of the abandoned Frontier Town. $20 million to improve state-owned ski areas on Whiteface and Gore mountains. Cuomo also said he is working with internet-service providers to ensure that all rural areas in the state, including the Adirondacks, have broadband service by the end of 2018. Typically, he said, internet companies are reluctant to provide broadband in rural areas because they find it unprofitable. 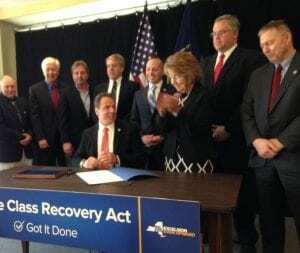 After speaking to a packed room in the Lake Placid Convention Center, Cuomo signed a ceremonial budget bill while local officials looked on.